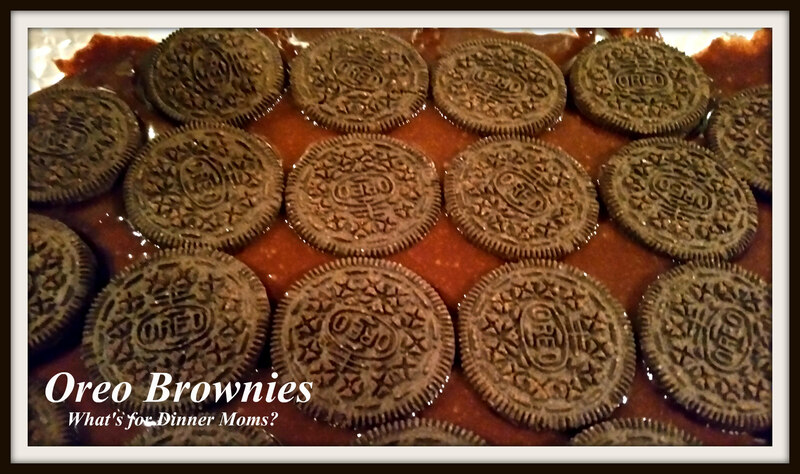 Oreo Brownies – What's for Dinner Moms? If you have been a follower of my blog for a while you know I mostly post recipes for entrees, sides and a few breads and very few sweets. I had my daughter make this recipe the other night and we were all surprised at how good it was. Brownies with stuff in them are delicious. Peanut butter cups, candy bars and even chocolate chip cookie dough are all delicious. We thought for sure that the cookies baked in the center would be soggy or the brownies would be too mushy or over baked. I am not a sweets person and I actually ate a brownie. My family was shocked that I actually wanted to try one. They looked so good I couldn’t pass it up. The added Oreo stayed whole and though it was softer it still had a bit of texture to it. It wasn’t mushy and you could taste the actual Oreo! These brownies would be delicious as a base to a sundae too. Preheat oven according to package. Line a 9 x 13 baking dish with aluminum foil. Spray the foil well with non-stick spray. Make mix according to package directions. Pour 1/4 of brownie mix in the bottom of the pan. Arrange Oreos in the pan to fill the pan. Pour rest of batter over the cookies. Bake according to package directions or until center is set. Do not over bake. Remove brownies from pan to cool before cutting. OMG!!! I have got to make these!! Two of my favorite sweets!! I am not a sweets person and I thought they were good! My family certainly tried. I think there was one row left the second day. Loving this… why ? Because it uses boxed cake mixes ! ! ! So easy ! You can make real brownies but sometimes a good boxed mix is just easier! Sounds good to me! And do you know that I used to detest Oreos when I was younger? They tasted burnt to me, lol! Lol. That is funny. I much prefer savory to sweet but I have 3 family members that don’t agree with me. They look phantastic, I will print the recipe and will it try it for one of our potlucks. I stay away from sweets, but I like to watch other people when they enjoy themselves. I’m so glad I read this. I shared it on Twitter. I will try something like this some day. Good to know how it turned out. It must be Oreo dessert week! They look fantastic, but I’m like you, I”m not a huge sweet eater at all. Yumm these look so good Marci! Very nice. I only blog cakes, biscuits and desserts so this is perfect for me. Try chocolate chip cookie dough at the bottom, Oreo in the middle, and brownie on top. They are also called “Sl***y brownies. As an oreo and brownie lover I will have to try this!! Thank you for sharing!! Yum!! I need to reblog this!!!!!!!!!!!!!!!!!!!!!!!!!!!! Wow, two of my favorite things! Oreos…yum! AND… BROWNIES… incredible. This just blew up my world! OK, I needed really needed to reblog this! Hope you guys like it! 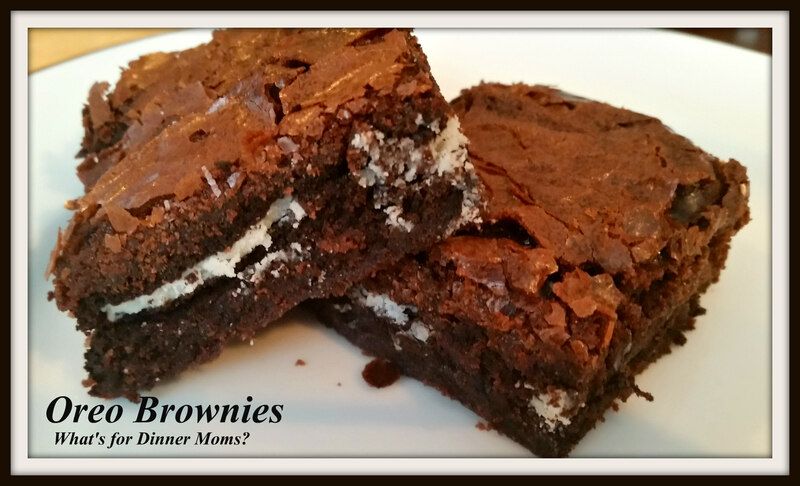 Pingback: Brookies (Using a Boxed Brownie Mix) – What's for Dinner Moms? Looks delicious! Thanks for the recipe – I have to make it one day soon!